To counter all the pranks and mischief everybody will endure today I decided to do something different. I will draw a safe rated flat color image for one lucky individual in my usual style. Pinkie promise. I'd like to give my watchers a chance to have a picture of their OC or a canon character of their choosing drawn in my style. To all of you who asked for a request before and got turned down, this is your chance. - make sure your character is of a MLP:FiM canon pony species (unicorn, pegasus, earth pony, alicorn). I'm not really familiar with any other species and won't be able to draw them as a result. You may include a desired pose with your comment but I cannot guarantee I will honor it. Winner will be chosen by me entirely subjectively out of all comments posted until 5th April 2019 6pm CEST. Anyone who is able to comment on this journal is eligible, even if you've received artwork from me in the past. I reserve the right to not pick a winner if no OCs are posted that I feel comfortable drawing. Expected delivery on the weekend unless something comes up. The finished image will be posted publicly on all my social media, non-negotiable. The winner will be notified via DA note, and I will be featuring the comment that won under this journal. Best of luck to all! The winner has been picked and will be contacted shortly. Thank you to everyone who submitted their characters. I saw someone's post regarding a scammy commissioner today, and wanted to share my own story featuring an individual who failed to uphold their end of the deal when it came to paying for what they ordered. Below you'll find a stiched together version of the end of the conversation we had on Discord, and an image proof that I completed their commission (with a bit more aggressive watermarking than usual, since I'm sure they're going to see this journal). I unfriended them immediately after they linked "their" YouTube channel, which meant they couldn't message me anymore. On the date of the last few messages I received a friend request from a completely different name, which, after I accepted it, revealed our previous correspondence. Their name has changed again since then, and I forgot to take screenshots of those messages at the time, so that's why you see their current name at the bottom. Their handle on Discord is Dargon#7811 (was Desert-Winds#7281 when I wrote this journal, I try to update this in case I see them change it again). They initially used the handle "HellMare." when they contacted me, and they used the DeviantArt account dragonslayer1896 when I gave them my Discord via DA notes. Since they have used over 3 different Discord usernames since I first added them, I suggest that if you want to make sure whether the person you're talking to is them, enable "Appearance > Advanced > Developer mode" in Discord settings, right click the name, and press "Copy ID". Paste (Ctrl+V) the ID somewhere, and if it matches this, it's them: 111666348307869696. As is apparent by my profile picture at the time of me writing this (current avatars are credited in my profile box) I'm stopping my commissioning hiatus. Some people just have such beautiful art styles I'm left speechless and wanting to throw money at my screen. I realize that there's no point in not supporting the people whose work I enjoy looking at just because of one single person I've had issues with in the past. I'm going to start commissioning people again as my budget allows. I have a couple artist on my radar, more specifically 2, but I'll continue to be on the lookout. I'll mostly be basing my choices on the referrals I get from friends whom commissioned my artists of choice in the past, as well as looking at how frequently they produce commissions to get an idea of the expected wait times. Having some form of instant messaging point of contact (preferably Discord) is also a big plus. That is it for now, thanks for reading this thing, I just had to get this out so I wouldn't feel bad about commissioning people with that huge "I'm not commissioning anyone ever again" journal on my profile. Boy, do I have a bad track record of getting screwed over by artists… If you ever considered to get a commission from Pokefound, the artist who took on Pokehidden's style and takes money in exchange for such images, it is time for you to reconsider. I asked for an NSFW commission and I am very dissatisfied with the entire process AND the result, so much so that I want to prevent anyone thinking of making the same mistake from going through what I did. Below I will explain the situation backed by unaltered (except blanking out his e-mail) Skype chat messages with exact timestamps as well as screenshots. Read the rest of the journal on my NSFW tumblr. I have been thinking about something that has often times been controversial and/or the topic of a debate: tracing. As most of you are probably aware, that's what makes up 95% of all of my deviations: traced artwork of ponies from the show, or traces of sketches. As for poses from the show, I can reasonably say that these might be subject to re-use, and often times the could be requests made through the MLP-VectorClub's Requests & Reservations site. However, with sketches, there's really no reason for one to trace them, and share the result publicly. If I trace a sketch because I like the character it depicts, that shouldn't mean that it's something I should publish. Maybe it's a good idea to send it to the artist who made the sketch, or ask them for permission before posting it, but definitely not uploading it straight away. In some cases, I'd probably be too nervous to send the image to the artist directly, and I'm also somewhat impatient. In the past I just thought "meh they probably won't mind" and posted the image blindly. I had to find out that not everyone shares my way of thinking, and now that I re-evaluated my past decisions, I don't agree with myself either. While making a vector out of a sketch, even though I may improve on the original drawing, in turn I'm also creating work that does not properly reflect what I'm capable of. Tracing an amazing, detailed sketch could just as easily give a positive, but false impression of my drawing knowledge as tracing a less well-made one could make my work look worse than I'd prefer. Not to mention what the artist, or the people looking at the artwork may think my intentions are with making said vector. Is he just doing it for fun? Does he want to gain attention by drawing over someone else's work? As an outsider, it's impossible to know what the creator might think before, or after, releasing an image for everyone to see. Some might say it's an improvement and welcome it with open hooves, others may think ill of its author. For many reasons combined, I've decided to completely stop tracing the sketches of other artists. I gave many possible explanations as to why I'm doing this in the paragraph above, and while this decision may have been influenced by other factors, I'd like to make it clear that this drastic change is solely needed for me to know that I have done everything in my power to have a smaller chance of being wrongfully accused of anything, by anyone. I'm not saying anybody did, or will do so, but I definitely don't want it to happen in the future. This won't change the fact that I'll still do traces from the show in the event that a pose I like gets requested on the reservations site, I'm mainly talking about sketch traces. Vote for the next PMV of Alanj2007Games! My personal favourite is "Overcome (This Time)", which one would you want to see? It is no secret that I'm only posting this because it's required by the rules. If you want your OC there, check it out before all the places are taken. Note: Don't comment on my journal, click the title of the post below and comment there if you want to enter. I've always been a big fan of watching well-made PMVs on YouTtube, and I still am, but now that I've created a relatively big gallery of vectors, I'm starting to notice my works being used in some of the videos that came out lately. What's really strange is that outside of DeviantArt and Derpibooru, crediting artists seems to be a concept that's unheard of. This applies to both Facebook and YouTube, both of which provide a description field which credits could be added to - yet NONE of the video makers I've checked so far listed vector artists by name or even the images themselves. Most gave no credit at all, and the few that did only said "…and images from the mlp-vectorclub.deviantart.com/" at the very bottom of the description. While it'd certainly be incorrect to treat traces of the show as my own, I, personally, still think that the 3-5 hours of work it takes to make an accurate vector should be reflected, and in a direct manner. This does not only apply to me, but the rest of the MLP vectoring community, as someone had to make those fancy pony vectors, even if they've been modified to fit the theme of the specific video. In the case of Facebook, 99.9% of the pages I follow do not mention the artist or the specific image, and if I like something that's posted there, I have to go out of my way to do a reverse image lookup on Google (which may or may not work) to find the artist and the image itself in it's original place. As a question for vector artists, would you be upset if you saw your work used without any attribution to you in a PMV that gets close to tens of thousands of views or more? For others, how often do you find yourself liking an asset in a video (or an image on social media) that you'd like to see and/or support the creator of, and maybe check out their other works? I'd love to hear your opinions. This journal will serve as a collection of positive experiences I've had with various types of art exchange on DeviantArt, and to get the word out there for those who deserve it. Pending processes will not be listed, only completed ones. I'll keep this list up-to-date whenever I make a commission or do an art trade in the future. I initially wanted to create a good/bad list, but decided to scrap the bad part, since I don't want to point fingers at artists I'd never even think about working with again. If you'd like a who-to-avoid list, you can always ask me about my experiences in a note. I will say, there's more bad than good, though. Badlanded (who no longer does pony commissions) is a great person and artist, and back when she used to do pony-related artwork I really enjoyed seeing it. When I saw that she took commissions, I jumped at the opportunity, because I knew I'd love the result, and that's exactly what happened. It was great while it lasted, and I wish her the best of luck with the species she's moved onto. January3rd is a great guy with a unique art style that I like very much. I've been following his works for over a year, and when I got the chance to commission him, I didn't need to think twice. Great communication, friendly, and allows for changes even after the image's almost finished! One of the best experiences I've had so far. Despite what he seems to believe, I think Le-23 is a great artist, and his work speaks for itself. The art trade that ended up happening out of a request from myself to him was kind of unexpected, but I was glad that I could return the favour. 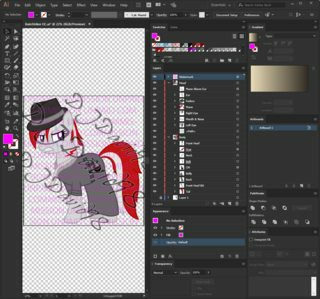 PaintTasticPony uses the tool she knows best to its fullest potential, her communication is great, and seems to be a nice person over all, with a lot of great ideas for original characters. And by a lot, I mean, a lot. Hello everyone! Recently my new processor arrived and it was built into my PC today, and from what I've seen I may be able to start live streaming again on my Picarto channel, but I still need to do some more testing to see how well it handles having Illustrator open. Would any of you even be interested in watching a live stream of me doing vectors? With the end of summer comes the end of scheduled weekly features. Don't worry, they will continue to come as I find new artist who could use some attention, but the goal of posting a journal weekly will be dropped, as I've ran out of the initial set of people I wanted too give a view boost to, and I'm not finding enough new ones in time. Here's one of his images that I find really good, but I could've chosen pretty much any other image from his entire Pony folder. Please go and have a look at his artwork, and maybe encourage him to make some more by commenting, adding images you like to your favourites and watching him. ...if you want to, of course. This artist not only has one of the most uniquely-designed OCs I know of, who goes by the name Brass Goggles, but just so happens to be Hungarian as well! Her artwork is an insta-fav 90% of the time, I just love her art style, and I hope you will too. Ladies and gentlemen, I present to you the artwork of Tokyone-Chan. Be sure to let her know that you like their artwork in case you genuinely do, she could use some more attention, as she's definitely getting less than what she deserves. When I upgraded to Windows 10 a few days ago, I needed a good wallpaper, and ended up downloading all six of his elements of harmony walls, which turned out to be a great fit! Been using them since, and with the automatic accent colour option, I get a different coloured desktop every 30 minutes, which gives it a really harmonic feel. Another week, another artist. Funny thing is, I sort of found this image right after I posted the previous feature journal, and I had to wait an entire week to post it! But, both last week's and this week's artist deserve their time in the spotlight. Meet Malifikyse and his heart attack inducingly cute drawing of the one and only Fluttershy. Cover your eyes right now if you're prone to fainting due to excessive cuteness, as this image will surely make you unconscious. Some of you may or may not agree with that statement, but that's not the point. Another week passed, and it's time for another weekly feature! Feast your eyes on the mazing work of MixiePie, a drawing of the one and only DJ of Equestria, sporting her favourite glasses. Choo-choo, all aboard the train! Due to the fact that I now have more than 250 watchers, I feel that it'd be selfish to keep all of that attention to myself. I decided to start sharing with all of you the amazing art I find while browsing around deviantArt. I bumped into the image below a few minutes ago, and I'm speechless. I personally love it and I hope you do too. Please give Miltvain some love and well-deserved attention, even if it's just adding the piece to your favourites if you liked it. Dec 14, 2015 Vote for the next PMV of Alanj2007Games!